The interface has been revamped to provide an increasingly intuitive and visually attractive experience for all users. A responsive framework and touch-friendly elements modernize the platform and enable users to update their website from anywhere, at any time. Agility’s redesigned CMS includes robust workflow improvements and performance updates in order to provide marketing and development teams with the ability and flexibility to deliver the very best in dynamic digital experiences – quickly and with ease. Now users can complete tasks in fewer clicks. “It’s cleaner and easier to use, and navigate,” Rotundo said. She also noted that publishing content is now much more seamless. One major Agility CMS update is the introduction of Dashboards, which provide improved insights to users on overall website performance, as well as user activity and recent changes made within the platform. 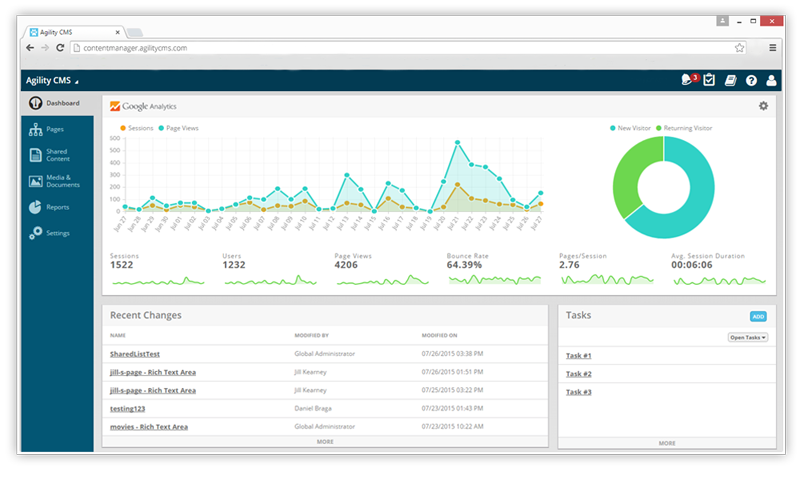 The Homepage Dashboard (above) includes integration with Google Analytics, and and pulls in metrics like weekly page views and average session duration. In addition to the Homepage, other Agility CMS Sections now include unique dashboards that consolidate information specific to their functionality. The Pages Section, for example, displays information about each webpage’s performance and activity, including a website’s top-viewed pages and top entry pages. Agility CMS’s redesign includes performance fine-tuning that makes the platform smoother, more responsive and faster than ever. Agility CMS now utilizes a next generation routing and templating framework, ASP.NET MVC, which makes the platform more flexible and robust. In addition, the amount of overhead database calls that accompany every request has been scaled back by up to five times. 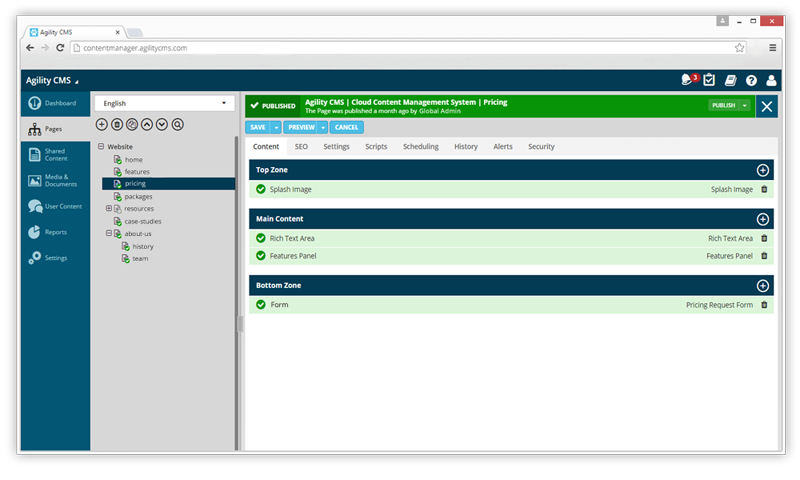 As a result, some Agility CMS workflows and tasks can be completed substantially quicker than in legacy content manager. “This a huge step forward for Agility CMS. The legacy content manager was built out 8 years ago, and it served us and our customers well. This new, upgraded version provides the same user-friendly experience – but it’s sleeker, faster and provides more value to all that login to the platform,” Jon Voigt, CEO of Agility CMS, said.